Have you heard of kombucha? You may have seen this beverage for sale at your local health food store. Kombucha is a fermented tea and a natural probiotic that is both delicious and health-supportive. It is known around the world for its detoxifying and energizing effects. Kombucha can replace yogurt or kefir as a probiotic in your diet if you prefer to be dairy-free. 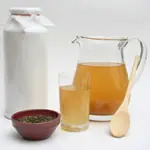 Kombucha is helpful for athletes because it aids in energy and detoxification by helping to bind environmental and metabolic toxins so they can be excreted through the kidneys. Kombucha also supports tissue growth and balances intestinal flora. Healthy flora is essential for preventing stomach and intestinal issues during exercise. Kombucha is made up of a living culture of beneficial microorganisms. The mass of microorganisms is called a Mother or Mushroom or SCOBY. The acronym stands for Symbiotic Colony of Bacteria and Yeast. A Kombucha SCOBY transforms sweetened tea into a slightly sour and fizzy drink similar to cider. 1. Purchase a bottle of organic raw kombucha from a health food store. Pour half the bottle in a bowl and cover with a terry cloth to keep out bugs or dust. 2. Let it sit for about 10 days in a warm dark spot in your kitchen. You will see a film form at the top of the liquid. This will thicken. After about two weeks, add it to an 8-oz. mixture of brewed green tea and two tablespoons of sugar. 3. Wait another two weeks and watch your SCOBY grow thicker. This latest brew should be the one you drink, but make sure to keep an ounce or two to add to your next batch as a starter. 4. The tea and sugar will feed the SCOBY and it will continue to grow more layers while it ferments and processes the sugar tea. The sugar and caffeine are what sustains the SCOBY so no need to worry about the added calories or jitters from caffeine. Virtually all of the caffeine and sugar are transformed into other compounds in this process. 5. For your second batch, brew 16 oz. of organic green tea and add three tablespoons of sugar. Now add your SCOBY. Pour the two ounces of saved brew on top. 6. Repeat this process every 10 to 14 days. Your SCOBY will grow to be many inches thick, at which time you can separate the layers to make multiple batches of Kombucha brew. When the bottom layers turn brown, throw them on the compost heap. Kombucha can go a long way to help boost your natural detoxification process and make you a healthier athlete. For more information, the book Wild Fermentation is an excellent source on fermented foods.